The Phillies host the San Francisco Giants today at Citizens Bank Park, aiming to pick up a win to avoid dropping an 11th straight series, a feat not matched since 1941. 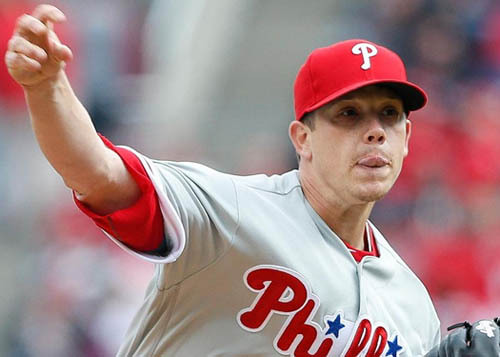 Philadelphia hurler Jeremy Hellickson hopes to turn things around following a pair of subpar outings - posting a 9.00 ERA along with just four strikeouts over 11 innings. The Giants counter with veteran lefty Matt Moore who comes to Philadelphia riding a streak of four consecutive quality starts with an ERA of 2.73 over his last 26 1/3 innings pitched. The Phillies won yesterday's contest, 5-3, to snap a five game skid. Ben Lively made his major league debut, tossing seven innings while giving up one run on four hits. Tommy Joseph tied the contest with a solo shot in the sixth before the Phillies added four runs in the seventh, three of which came on Odubel Herrera's bases-clearing double. Nick Pivetta is with the club today in Philadelphia and will make the start tomorrow in Atlanta when the Phillies open a series with the Braves. Pivetta has started four games already for the Phillies, going 0-2 with a 5.12 ERA.